Despite the commonly-touted gloomy economic outlook, some reports have shown that Chinese consumer confidence remains resilient. As wages continue to rise, urbanisation furthered, and unemployment rate kept under guard, Chinese consumers are still willing to spend and continue to unleash their spending power. 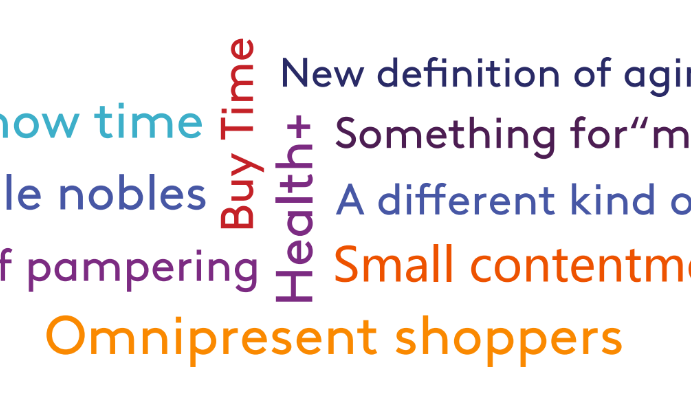 However, how consumers spend and why they are spending has undergone significant changes in recent years. 1. Something for “me” (我要我不同) – The new consumer is not going to settle with something everyone uses, but something unique to set her/him apart from others. 2. Small contentment (生活小確幸) – Self-defined happiness is taking over the traditional definition of success (i.e., wealth and status) and will become a new pursuit. 3. Self pampering (珍惜我自己) – Modern lifestyle and western values are affecting how Chinese consumers see themselves in relation to family and their social circles. Although family and social obligations are important, one’s own needs should also be taken good care of. 4. Show time (你秀我也秀) – The sense of “self” is manifested by Chinese consumers’ strong desire to be visible on social media. Behind the obvious motive to show difference, also lies the desire for social approval. 5. Health+ (健康升級) – A new level of consciousness on health and well-being unfolds. This is reflected in the basic necessities of life (e.g. clothing, food, shelter and transportation, etc. ), from physical health to a holistic view of body, mind and soul. 6. Buy time (時間無價) – Time scarceness is a pain point for today’s consumers. Consumers are willing to buy time to free themselves from the boring and repetitive chores for hobbies/favorite activities. 7. Omnipresent shoppers (購物無界) – Chinese consumers are now global shoppers and are able to shop anywhere, whenever they want. 8. A different kind of youth (非凡青年) – Millenials are more diversified and digital natives. Their views and knowledge are greatly shaped by the internet world. 10. New definition of “aging” (銀髮金礦) – People who were born in the 60s are about to enter retirement age. This segment of consumers have a greater level of confidence than their previous generations, financially, physically and psychologically. “The rise of e-commerce and social media are increasingly important facilitators of the change. All of these have posed infinite opportunities and big challenges alike to marketers. Only when brands accurately capture the pulse of the new consumers can they weather the competition in this huge and ever-changing Chinese market,” Sandy Chen, senior director of Kantar TNS China said. According to TM, this new era of leadership, with a strong combination of industry, marketing, financial and operational expertise..